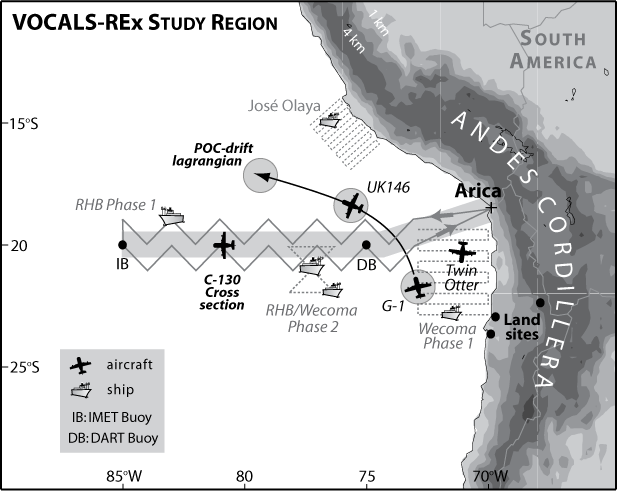 The VAMOS Ocean-Cloud-Atmosphere-Land Study - RegionalExperiment (VOCALS-REx) is an international field experiment designed to better understand physical and chemical processes central to the climate system of the Southeast Pacific (SEP) region. 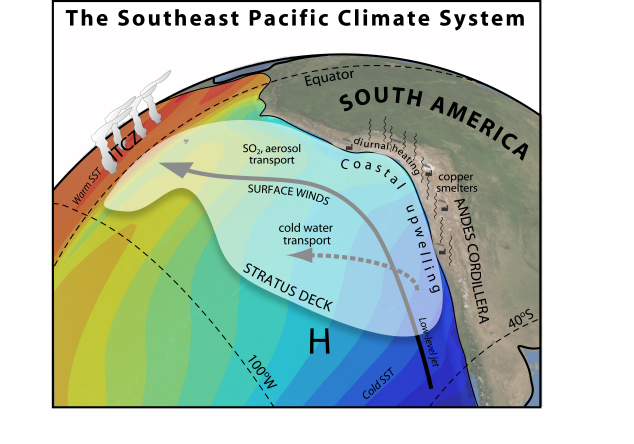 The climate of the SEP region is a tightly coupled system involving poo rly understood interactions between the ocean, the atmosphere, and the land. 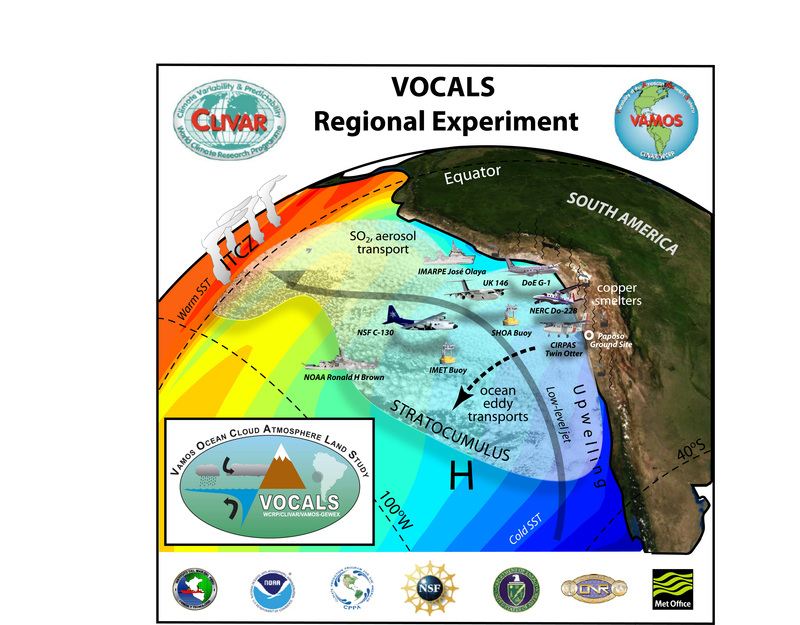 VOCALS-REx will focus on interactions between clouds, aerosols, marine boundary layer (MBL) processes, upper ocean dynamics and thermodynamics, coastal currents and upwelling, large-scale subsidence, and regional diurnal circulations, to the west of the Andes mountain range. The field experiment is ultimately driven by a need for improved model simulations of the coupled climate system in both the SEP and over the wider tropics and subtropics. VOCALS-REx will provide detailed and targeted observations of those processes that impact the SEP climate system and are amenable to study with a month long program. The intensive field observations are a vital component of the broader VOCALS program and have been carefully designed to complement a suite of enhanced long-term observations. The long-term observations provide important context for the intensive observations. In addition, a major thrust of the VOCALS program is to provide coordination for modeling activities, which will benefit from the intensive observations in a poorly observed region where coupled ocean-atmosphere models exhibit strong biases in sea surface temperature. The coordination through VOCALS of observational and modeling efforts will lead to an improved pull-through for climate and regional forecasting agencies. Multi-disciplinary intensive observational datasets will be obtained during VOCALS-REx from several platforms including aircraft, research vessels, and a surface land site. These datasets will be used to test a coordinated set of hypotheses that are organized into two broad themes: (1) improved understanding of aerosol-cloud-drizzle interactions in the marine boundary layer (MBL) and the physicochemical and spatiotemporal properties of aerosols; (2) improved understanding of the chemical and physical couplings between the upper ocean, the land, and the atmosphere. The intensive observational period will be a month long and will take place during October 2008, chosen because it is the month during which the coverage of stratocumulus over the SEP is at its greatest, the southeast trade winds are at their strongest, and the coupling between the upper ocean and the lower atmosphere is at its tightest. until the only flower was the falling itself. the unrealized ambitions of the foam.